At Skateaway we pride our self in being a family skating establishment. The following rules are enforced for your safety. All sessions have age recommendations and restrictions. NO HATS OR HEAD COVERINGS permitted on the skating surface. ​Everyone on the premises must conduct themselves properly for a family atmosphere. Alcoholic beverages, illegal substances or anyone under the influence will not be permitted on the premises. We are a smoke free facility, parents who wish to smoke may remove their skates and step outside to do so (state law prohibits smoking by anyone under 18yrs/ID required). No profanity or obscene gestures of any kind. ​No in and out privileges. Management reserves the right to ask anyone to leave at anytime. No loitering (over 15 minutes on the property is loitering). NO gum chewing by anyone! – SKATERS / PARENTS / ON-LOOKERS. ​If you are pregnant or have a medical condition or injury that may be aggravated by exercise please do not skate. Patrons must report any injuries to management. All food and drinks including bottled items must be kept in the snack bar at all times. DO NOT hand food or drinks over to anyone standing on the main skating surface. No pushing shoving or tag playing at anytime on the premises. No sitting on tables or walls or climbing over the walls. Please keep moving at all times while on the skating surface. DO NOT at anytime carry children while on skates. No loose objects or electronics devices (cell phone, Ipods, cameras, etc..) permitted on the skating surface. The games are not ours and we cannot give refunds. Play the games at your own risk. No skates that have been worn outside, unless they have been cleaned and are free of debris. 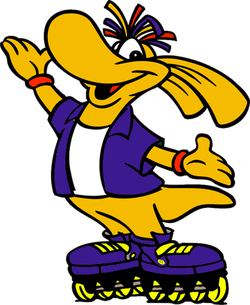 There is no skating backwards at anytime except when the DJ specifies that it is permitted. Everyone must have skates on at all times except parent spectators. Roller skating is a strenuous and fast moving sport. By putting on skates and participating in this form of recreation, you are assuming the risk of an accident inherent to this and any similar sport. It is the nature of this form of recreation that people fall down or run into one another on occasion. 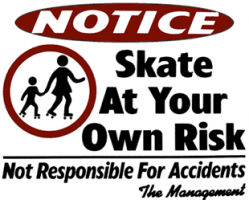 If you are not willing to assume that risk, please do not skate here.